"When Mrs. Alton Jones donated our current campus on Dover Street in the mid 1970s, Chesapeake Center officially had roots to develop a firm foundation for future growth. Each year the Center has been able to add additional services that benefit people with disabilities so that they can contribute to society and to the local community. I am happy and proud to have been a part of these exciting developments since 1981." 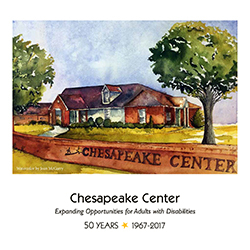 Chesapeake Center, Inc. was founded in 1967 by a group of concerned parents, desperate to find meaningful opportunities for their adult children with disabilities. The property at 713 Dover Road was donated by Talbot County philanthropist, Mrs. Alton Jones. Local businesses Willow Construction, Duncan Masonry, Tom’s General Services, H.W. Heinsohn, Inc. and Eastern Shore Hospitality were instrumental in the construction and renovation of the buildings on the Dover Road campus. Learn more about our jounrey through the years and our 50+ years of growth! Chesapeake Center provides Vocational Training through on the job training so employees with disabilities can earn a paycheck for work performed. Some of the participants that attend daily are transported in vans owned by the Center, traveling from Talbot, Caroline, Queen Anne’s and Dorchester counties. 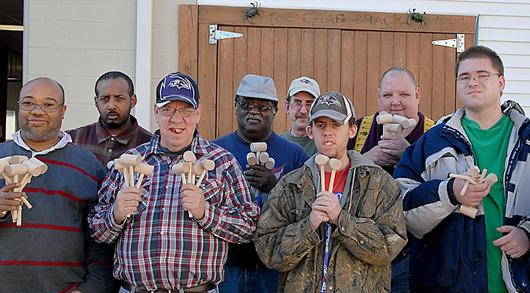 Many vocational consumers live in residences owned and operated by Chesapeake Center. Living with 3 to 8 other adults, Group Home residents learn how to take care of themselves and their house. For those who master household skills and can safely live alone, Chesapeake Center offers drop-in Support Services by trained staff. As a not for profit agency, Chesapeake Center is reimbursed for many of its community-based services by the Maryland Department of Health and Hygiene’s Developmental Disabilities Administration. Eligibility is determined by DDA by contacting the Resource Coordinator from the County Health Department where the applicant resides. Learn more about Chesapeake Center by downloading our literature. Learn more about Chesapeake Center, Inc.'s first 50 years! 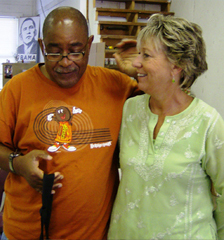 Learn more about the services provided by Chesapeake Center, Inc.
Chesapeake Center daily serves over 100 adults with various disabilities: 74% reside in Talbot, 13% from Dorchester, 11% from Caroline and 2% from Queen Anne’s counties. Chesapeake Center, Inc. manages a multi-building campus, located at 713 Dover Street that includes administrative offices, a large work center, a bakery and residences, while serving a diverse adult population from the Mid-Shore region. They also own and manage 13 group homes and maintain a fleet of 25 vehicles. Willard C. Parker, II, Esq.